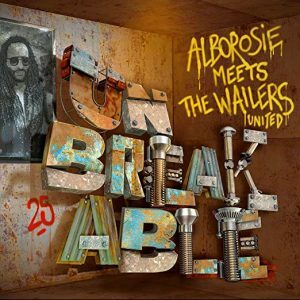 Alborosie Meets The Wailers United, released on June 29th and that’s shared with members of Bob Marley’s former backing band The Wailers. Former keyboard player Tyrone Downie was first of the Wailers to join the sessions, followed by guitarist Junior Marvin, bassist Aston “Family Man” Barrett and his son Aston Junior, who plays drums just like his uncle, the late Carlton Barrett. Together, they bring the distinctive feel and sound of reggae’s most successful ever rhythm section to a project that also features Chronixx, Jah Cure, rising young roots band Raging Fyah and the veteran Beres Hammond. Whilst the Wailers’ classic one-drop sound is all pervasive, Unbreakable is an Alborosie creation first and foremost. Italy’s finest reggae export wrote, arranged and produced the majority of tracks at his own Shengen studio in Kingston, where he’s mastered the art of making music that combines old school influences with unbelievable freshness. All drum tracks & bass (tracks 2, 7, 9, 11, 12, & 13) were recorded at BAD Lions Studio, Pompano Beach, FL 33064.